Hannah JUST squeezed in to their age requirements at 18.5 months. 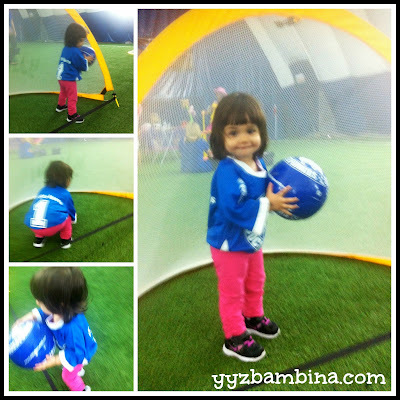 She was barely walking six weeks ago, so it was pretty impressive to see her running around in an uber cute soccer jersey, dropping then catching a soccer ball. In our class, we had two coaches who were amazing with our daughter. They were friendly and upbeat and kept the class moving at a good pace, realizing the limitations of their players' attention spans. We began by sitting in a circle, and after grabbing a ball, practiced holding the ball with one foot. Then we moved on to a game of Red Light, Green Light to practice our running. We pretended that the field dividers were a piano and a drum. 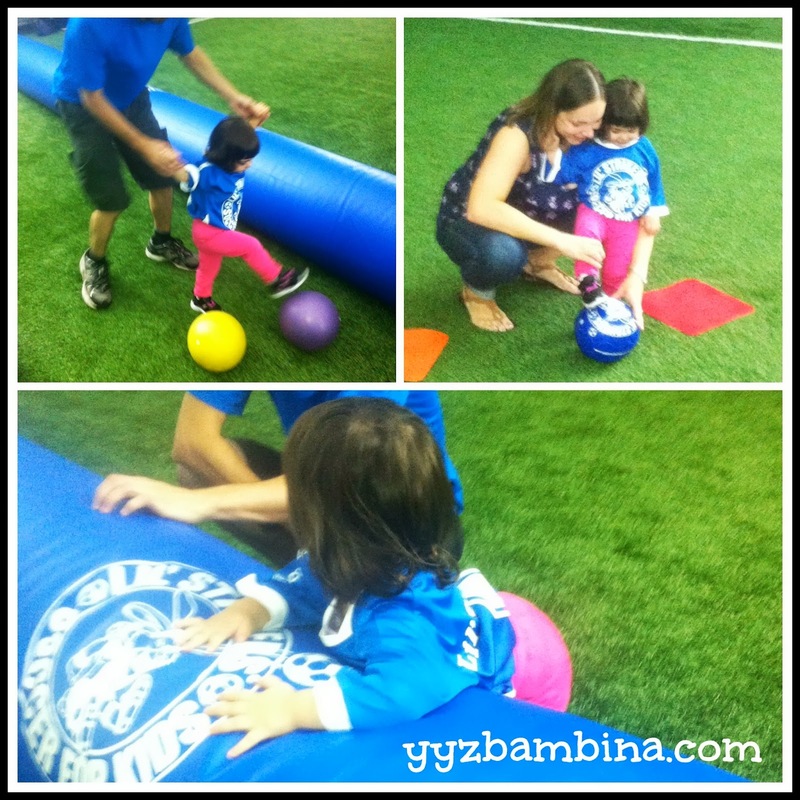 Afterwards, soft balls came out and we practiced our kicking. 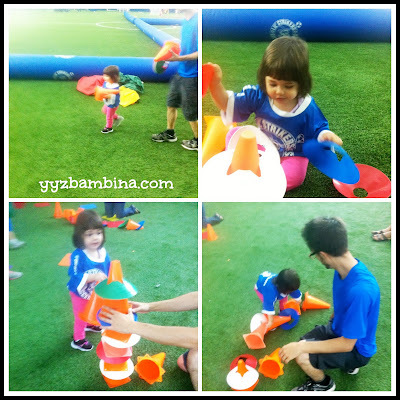 Another kicking activity (and my personal fave) was the tower of cones. We helped Hannah build a tower as tall as her, but she didn't really understand she was supposed to kick it and sort of just pushed it down with her hands (Chris thinks she wants to be a goaltender). It was then time for what was clearly Hannah's favourite part of the class - the parachute. The coaches and parents/caregivers gave the kids a ride on top of the parachute. With the look of happy entitlement on Hannah's face as we moved her slowly around, I seriously thought she might put her hand up and give a royal wave. She also really enjoyed running underneath the parachute as we held it up, running to different colours the coaches called out. It was a fun class that engaged Hannah and left Chris and I sweating. As you can see, the class assisted Hannah with her balance (hooray! ), coordination and listening skills as she moved from activity to activity. 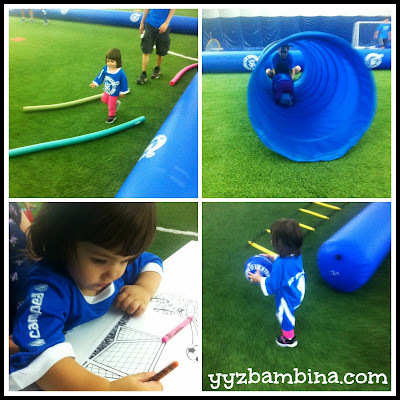 She practiced her colours, her motor skills and socialized with other children. I can't wait to see how much progress Hannah makes this fall. 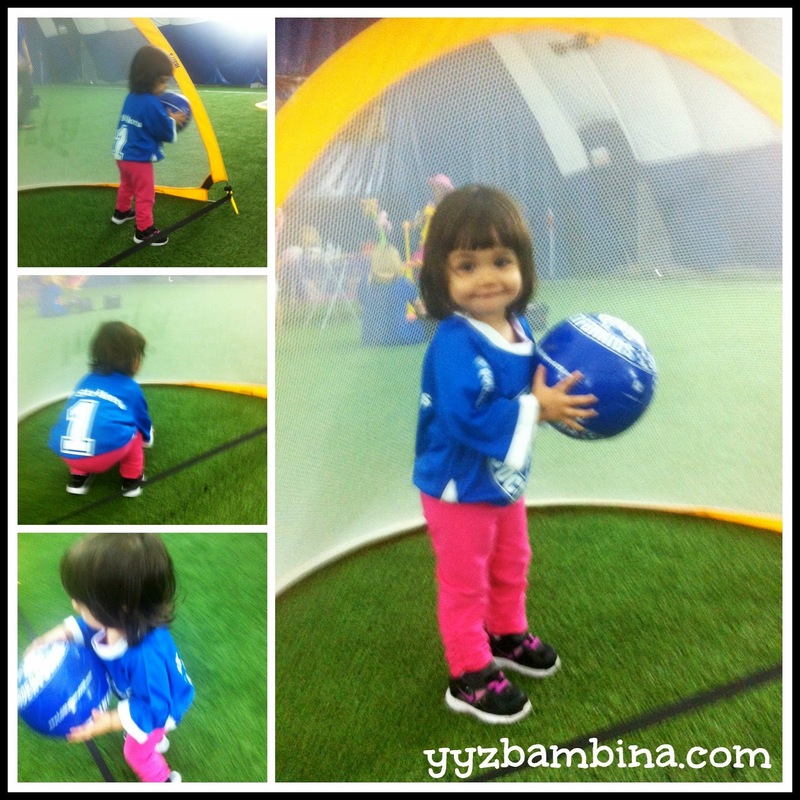 (And it excites me to no end I can join her in a sport without having to get her out of a wet bathing suit at the end.) My greatest hope is that Hannah will have better balance than me, which might just be the case when she graduates from the Bunnies class! Registration is open now and classes start Sept. 5th. We received a free class for the purpose of this review. As always, all opinions on this blog are my own. so cute! 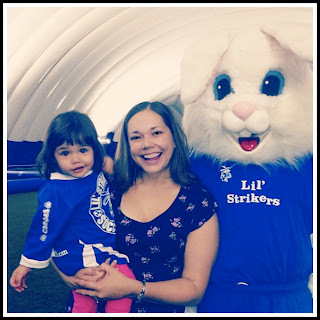 We have a similar club in Vaughan called Little Kickers! And how cute is Hannah!? Sounds like a great program. Looks like Hannah (and you and Chris) had a wonderful time. Keep us updated on Hannah's progress. So adorable! We have a community centre class like this and our DD was only OK with it. She isn't much of the sporty type of girl but I know our son is going to LOVE it when we find a time that works with our schedule. OMG she is the cutest ever! The program looks fantastic - love that kids get to try organized team sports so early. This is incredibly sweet! 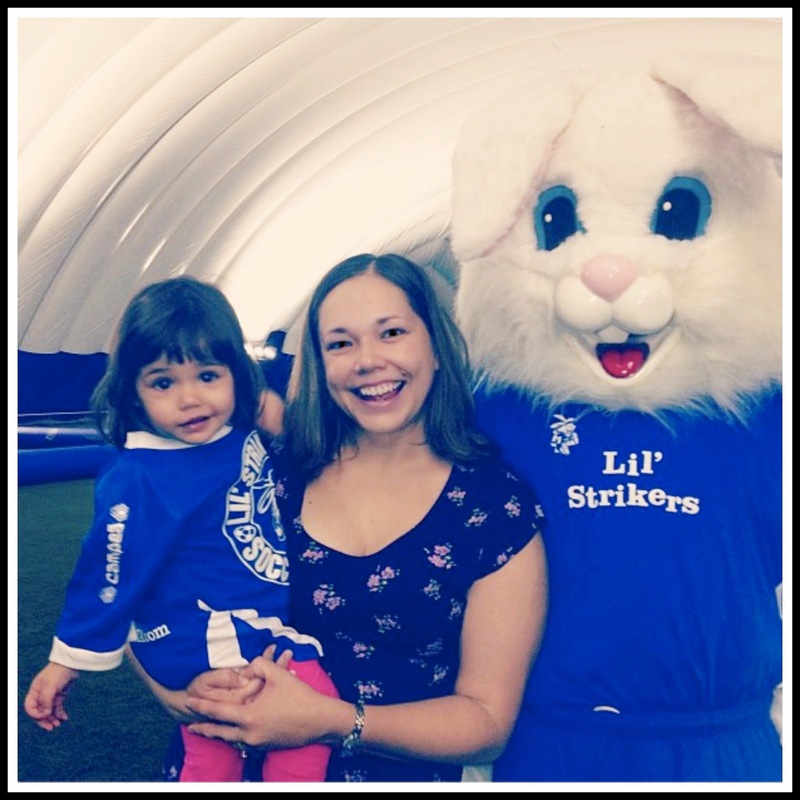 I have been wanting to get both of my kids into soccer. This looks like a great program.